The Senate of UWM particularly recognised Prof. Kanno’s help in gaining access to modern technologies, especially in coma treatment and his support of the cooperation of Japanese scientists with the University of Warmia and Mazury. 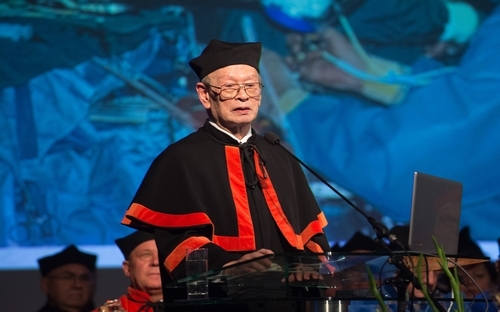 Prof. Kanno received the doctorate during the inauguration of the new academic year on 2 October. Professor Kanno of Fujita Health University developed an innovative method of waking coma patients. The method involves stimulation of the upper parts of the spinal cord, which was first applied in the early 21st century in Japan. The condition of over half of the patients improved after the procedure was applied. Following Prof. Kanno’s recommendation, Prof. Issao Morita – his disciple – began cooperation with the UWM Teaching Hospital. Under his directions, the team of surgeons led by Prof. Wojciech Maksymowicz performed pioneering surgeries on coma patients in May 2016 – the first such surgeries in Poland. The condition of the majority of the patients improved and several of them woke up. Prof. Kanno developed modern neurosurgery in Asia with Fujita Health University being the centre for teaching and educating young scientists and professionals dealing with nervous system surgery. Thanks to Prof. Kanno’s efforts, over 3.5 thousand young doctors from Asian countries had an opportunity to broaden their knowledge at 10 science and training conferences. His particular merit lies in the fact that he promoted pioneering methods of surgical treatment of diseases of the brain and the spinal cord with advanced microsurgical and minimally invasive techniques. His scientific interests include techniques of neurosurgical procedures, especially in areas of the greatest difficulty, diagnosis and treatment of cerebral haematomas, surgery of gliomas, treatment of hydrocephalus, applying neurostimulation in patients in a chronic vegetative state. His unique anatomical and clinical studies on the importance of the venous system in the brain initiated a change in the surgical strategy in many cases. Prof. Kanno’s achievements in modern neurosurgery are known and recognised around the world. His original methods of treatment of coma patients, especially stimulation of posterior cords, give tangible effects and provide a chance to the patients. The scientific achievements of Prof. Tetsuo Kanno have won him the greatest recognition among the global neurosurgical community, which is reflected in the title of the Honorary Chairman of the World Federation of Neurosurgical Societies (WFNS). He chairs the Japanese Congress of Brain Tumour Surgery, which was created on his initiative, and he is the Chairman of the Japanese International Medical Cooperation Organisation (JIMCO). Professor Kanno has organised and chaired many prestigious scientific congresses where methods and results of surgical treatment of strokes and achievements of young Asian neurosurgeons have been presented. He has received many important awards and distinctions, e.g. : Founder’s Laurel ACNS, Dokusoichiri award at Fujita Health University and the Medical Achievements award. His accomplishments have also won him the title of Honorary Professor of the Fujita Health University. - On his recommendation, the first surgery in Poland which involved the implanting of a unit stimulating the cervical spine in coma patients was performed at the Neurosurgery Clinic by his disciple – Prof. Isao Morita in cooperation with neurosurgeons of UWM. The expertise of Prof. Tetsuo Kanno and his disciples not only have contributed to the development of knowledge and skills of doctors at UWM, but also have provided new opportunities to the groups of the most seriously ill patients in Poland, for whom no protocol has existed so far – emphasises Prof. Wojciech Maksymowicz, Vice-Rector of UWM and the promoter of Professor Kanno’s doctorate honoris causa.